FULL DAY CAPE WINELANDS TRIKE TOUR. Description: A beautifully scenic trike tour for two along the world famous Cape wine route with various stops including two wine tastings. Itinerary: We depart from your hotel or guest house in city centre at 09h00. We take a leisurely ride along the N2 motorway stopping on top of Sir Lowry’s Pass for a mind-blowing photo stop. The views from here are incredible. We then ride through Grabouw, South Africa’s apple capitol, via vast apple orchards past numerous well maintained farms. We ride over the majestic Franschhoek Pass stopping for a photo shoot overlooking the truly stunning Franschhoek valley. Franschhoek was voted as one of the top ten most prettiest towns in the world and you will surely agree. Here we will stop for lunch and a drink or six at one of the many restaurants the town provides. After lunch, we ride over Hell’s Hoogte pass to Stellenbosch, the second oldest town in South Africa and the wine capitol of the country, where we will stop at Oom Samie Se Winkel, an old general store where you will surely find something of interest to buy. Next stop will be at Blaauwklippen Wine estate for some wine tasting. From Blaauwklippen, we travel to the historic Spier Wine Estate for some more wine tasting. From Spier we begin our final leg of the tour along the N1 motorway back to Cape Town to your hotel or guest house where we will unfortunately have to say our good bye’s. Two wine tastings are included in the price. Approx. 7 hour to 8 hours. 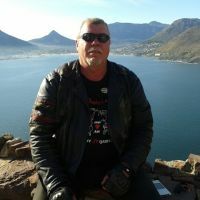 full day cape point & peninsula trike tour.